1/24/2016 11:45am Tucson-area (Pima County Sheriff’s dept investigates). 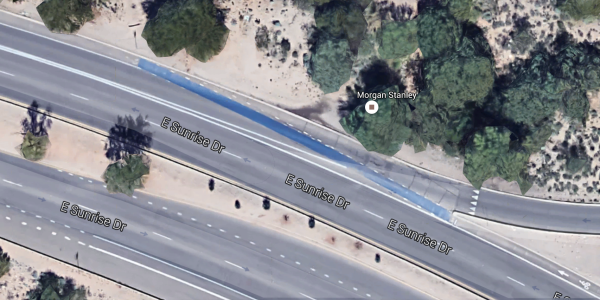 A (somewhat elderly, coincidentally) female bicyclist traveling west on Sunrise Drive was killed by a very elderly motorist who was merging from Skyline Drive and apparently failed to yield. The bicyclists was later identified as 69 y.o. Patricia Lyon-Surrey. Take a look at the aerial view of Sunrise and Skyline Drives. This is a fairly appalling and odd roadway design I would describe as having the geometries of a super-highway merge/acceleration ramp. It’s pedal-to-the-metal, there’s virtually no reason to ever stop or slow, so why bother? The only bump in the road, so to speak, for mergers would be from a bike lane (painted blue, no less) crosses their path. wow. 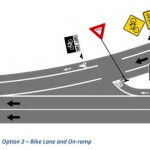 This configuration seems to have been done by someone who favored bike lanes rather than prudent roadway design. If a freeway-style acceleration ramp is really what is desired; this scheme could be used… though a retrofit to this style looks difficult. In this version the bicyclist yields to the ramp traffic. I think a freeway style free-flowing high speed ramp is totally inappropriate. One possibility is to add a series of alternating side chokers to narrow the effective width of the ramp dramatically. The problem now is it’s ~ 15′ wide (curb-to-curb) with a huge radius, motorists feel comfortable whipping along at 40mph. The maximum width of a vehicle body is 8.5′, ten-feet of effective lane width is plenty; so adding a series of 5 foot wide chokers / chicanes would slow ramp traffic naturally and dramatically. Tucson.com story about fix – proposals. Where there is a yield now, should probably be replaced with a stop (not that anyone complies with stop signs generally, but they do slow down) but there you have it. A stop (or even a yield) isn’t indicated here except for the odd criss-cross bike lane. In a June 2016 story County listening to cyclists on Skyline-Sunrise redesign, it sounds as if the “short term” plan is to add a speed table, and leave the yield a yield, and oh yes, change the blue paint (which is wrong, as noted below) to green (which is ok, as noted below, but Pima County must still seek approval for it’s use). What about the Blue Paint? Although colored pavement bike lanes have interim approval (“IA-14”), jurisdictions must still seek approval for their use. The first thing i wonder is why I can’t find Pima County on the list of IAs? And assuming they have the approval, I wonder why the paint is blue, because the current (for years) approvals have been only for green. If used, yield lines (see Figure 3B-14) shall consist of a row of solid white isosceles triangles pointing toward approaching vehicles extending across approach lanes to indicate the point at which the yield is intended or required to be made. The county installed a couple of speed tables in July 2016. Not sure how that’s worked out; as I write this about 9 months have gone by so maybe there’s some consensus, or better yet, data? I still think chokers to narrow the effective width to about ten feet would do a better job of slowing. Do they have FHWA approval to experiment with blue bike lanes? Green has interim approval, within limits, but blue seems totally nonstandard and would seem to invite liability even for a prudent design.